Researchers at Monash University are one step closer to developing a cancer drug triggered by light, preventing the toxic side effects caused by current chemotherapy treatments. Combining modern computing with existing techniques is driving the new insights. Designed to kill cancer cells in specific targeted areas, the photoactive drug can be inserted directly into cancerous areas, and will remain completely inactive and non-toxic unless triggered by light. Such light can be directed straight to the tumour, thereby minimising damage to healthy tissue. The results of the study published in Chemistry: A European Journal may have significant consequences for those undergoing chemotherapy treatment. Currently, the majority of such patients receive therapies developed over half a century ago, using platinum-based compounds such as cisplatin. These treatments cause toxic side effects by attacking healthy cells as well as cancerous ones. The findings offer new hope that photoactive chemotherapy drug candidates such as this, will progress from laboratory to future trials. Image courtesy of Warwick University. “It is important that we understand how these new light-activated platinum compounds kill cancer cells. We believe they attack cancer cells in totally new ways and can combat resistance,” says Professor Peter Sadler of the Monash Warwick Alliance. 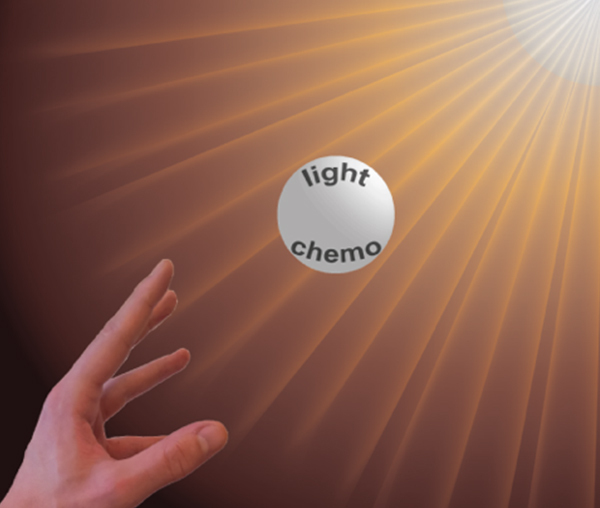 "We hope that new approaches involving the combination of light and chemotherapy can play a role in combatting the current shortcomings of cancer therapy and help to save lives." Study co-author Associate Professor Bayden Wood from the Monash School of Chemistry, described the findings as a great step forward in understanding the chemistry of how these new anti-cancer agents become activated by light and how their structure changes in the process to attack tumour cells. “It also shows the power of infrared spectroscopy and computational methods to study these complex dynamic molecules,” Associate Professor Wood said. “This study has global implications because we now have a better understanding of how light can be delivered with a very high spatiotemporal resolution, to selectively activate anti-cancer drugs at their site of action and thus improve the tolerability and safety of chemotherapy,” he said. A joint project between Monash University and University of Warwick, the new research looks at how a more recent platinum-based chemotherapy drug candidate (trans,trans,trans-[Pt(N3)2(OH)2(py)2]) functions when activated by light. Researchers are using a new technique called Attenuated Total Reflection infrared spectroscopy, combined with modern computing, to provide new insights into these light-activated molecules. The process involves shining UV-Visible light to activate the compounds and using infrared light to measure the vibrations of its molecules when activated. The spectroscopy was backed up by computational calculations supervised by study co-author Associate Professor Katya Pas, also from the Monash School of Chemistry, who helped to identify the chemical bonds which change when the complexes become activated. “With recent developments in computational chemistry and the advent of massively parallel computers, computational chemistry has become powerful in predicting spectroscopic properties of anti-cancer drugs, which will ultimately lead to the development of new drugs with higher potency and less side effects,” Associate Professor Pas said. Results have shown that some of the organic ligands, which are attached to the metal atoms of the compound, become detached and are replaced with water, while others remain stable around the metal. “This study in particular is dedicated to our late friend and colleague Professor Leone Spiccia who instituted and reinforced this work under the Monash Warwick Alliance,” said Associate Professor Wood.